So, you want to take some beautiful nature pictures, but you are just a beginner and you don't really know what would make good subjects or how to get those really great shots. 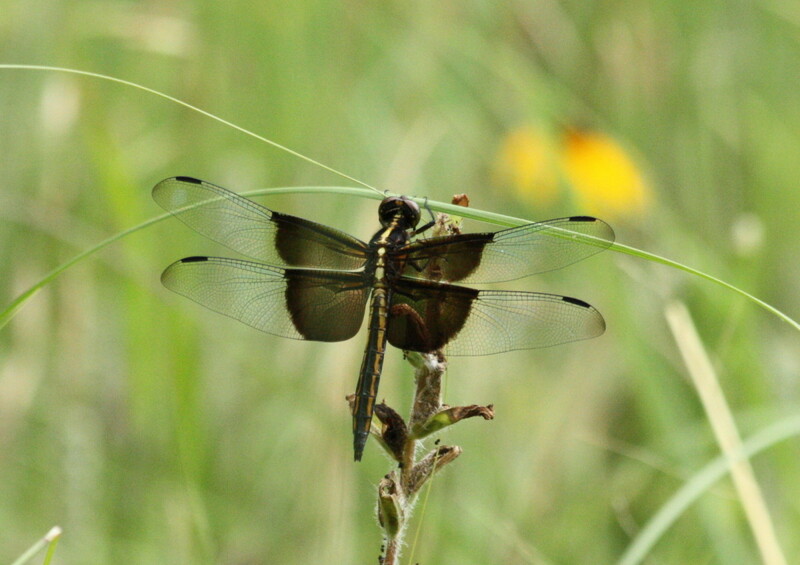 You don't have to go very far to find subjects for nature photography. I have found many, many subjects to photograph right in my own backyard. No matter what area you live in there is always a host of subjects to photograph. Whether you live in an arid area with desert and cactus or have flowerbeds, trees, and wildflowers. There is always an abundance of subjects to photograph. 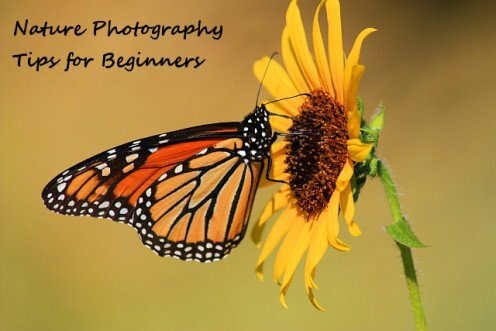 Here are a few nature photography tips for beginners. Bird photography is one of the favorite genres of nature photographers. Here are some tips for beginners on how to take great bird pictures right in your own backyard. One of the first things people think of when taking nature photography are birds. Birds are always a great subject and you can find them anywhere! Birds come in all shapes, sizes and colors. 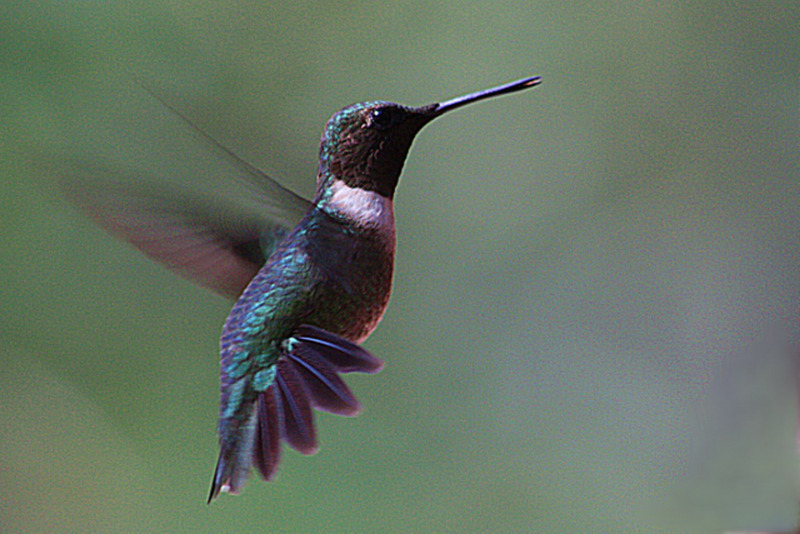 If you have a bird feeder or a hummingbird feeder at your house, you should have plenty of subjects to photograph. If possible, set your bird feeder up near a window in your house. I have taken some really good pictures through my front windows. Sometimes leaves and tree branches can get in the way of a good shot. Here is a little trick I use to get a clear shot. I walked around and found a long dead tree branch and removed all the old dead leaves and small branches. I left a branch on the end for the birds to land on. The branch was almost as tall as the height of the bird feeder. Then I leaned the branch against the tree near the bird feeder, with the branch at the top. This gives the birds a branch to sit on, without all the leaves in the way, while they are waiting their turn at the bird feeder. So now I can get a good, unobstructed shot of the birds. Inside or outside, a tripod is a great item to use if you can, but it you don’t have one, try to hold the camera as still as possible. Depending on the type of camera you are using you may want to brace your elbows on something sturdy to reduce camera shake. Using a zoom lens is going to give you your best shots. Don't try to zoom in to close, you want to get some pictures of the birds as they are flying to the feeder too. You can always crop the picture if you need to. Try to pre-focus your camera on a limb or branch where the birds tend to land before they actually go to the bird feeder. If you have the type of camera that can take pictures in “bursts”, use this setting. You may get some pictures of the birds as they are in flight, which is always a great shot! Use your flash or a high speed on your camera to reduce any motion blur. Now be a little patient and take lots of pictures. You may be surprised at some of the good shots you will get! Another favorite subject for nature photographers is flowers. Wildflowers or planted flowers in your flower gardencan make beautiful nature photography subjects. 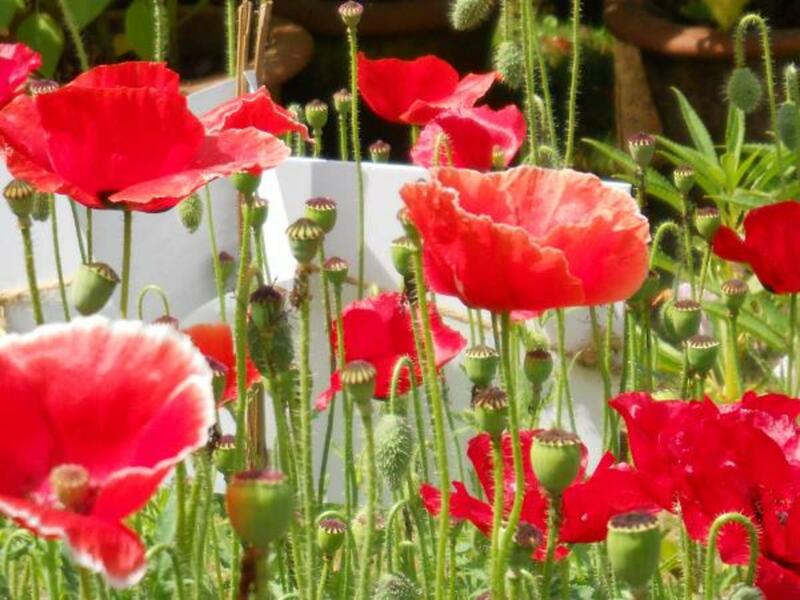 Don’t limit your pictures to the entire flower-bedor the field of flowers, get in close too. 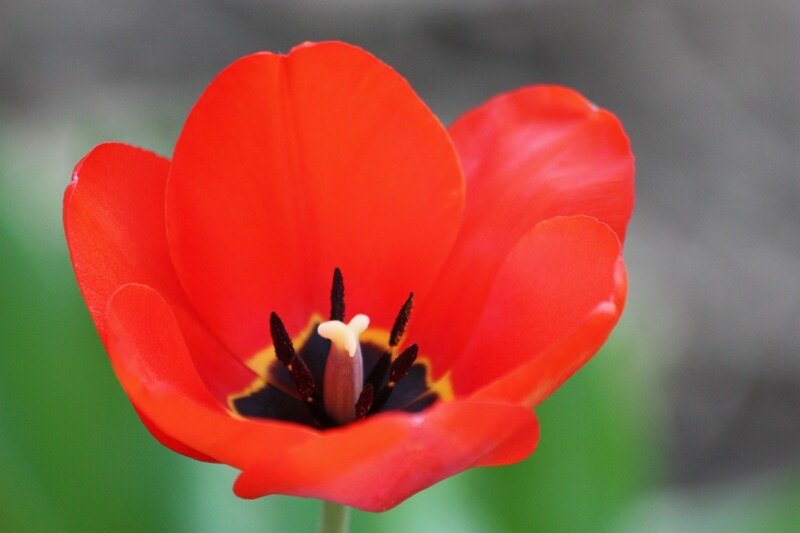 Even if you have taken pictures of the flower previously, experiment and try something new. Stand on top of something and shoot down on the flower, or just the opposite, get down low and shoot up from the bottom. Different times of the day can really change the image. Try some pictures early of a morning, then mid-day and late afternoon. You may be surprised how the different lighting will change the effects of the picture. Taking pictures of flowers right after a rain or with dew on the petals is always a wonderful idea. Raindrops on the petals can make for an amazing picture. You can even take a spray bottle and spray your flower lightly with the water for a great shot. Be sure to look for butterflies or perhaps ladybugs on your flowers. 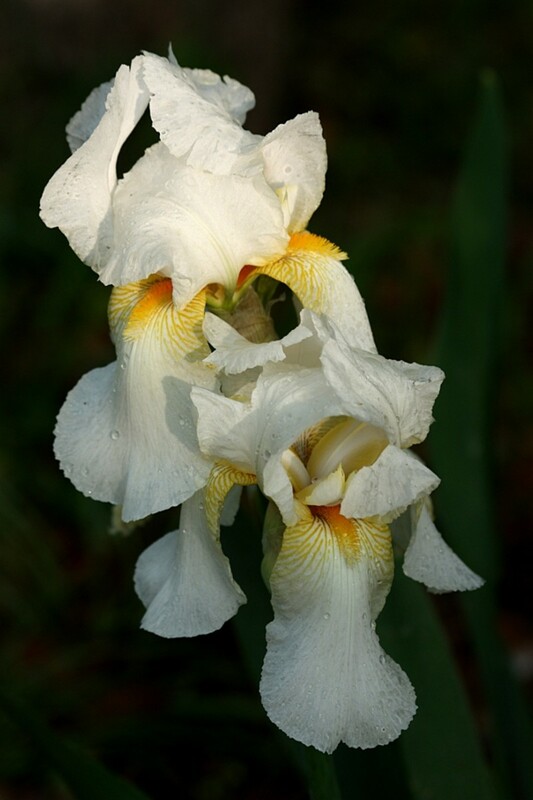 Try zooming in a little tighter than usual, as on this Bearded Iris, you may find some interesting shapes or textures. Everyone has some type of wildlife in their backyard, maybe its rabbits, squirrels or the occasional deer. Maybe you live in an arid area and your wildlife is lizards and jack rabbits. They are all interesting and beautiful members of nature. I like to get up just as the sun is coming up and sit outside with a cup of coffee and just watch the “critters”. Sometimes you really don’t know what you might find until you just go outside and look around. Again, a telephoto or zoom lens is a great asset. A good zoom lens is going to give you more flexibility. 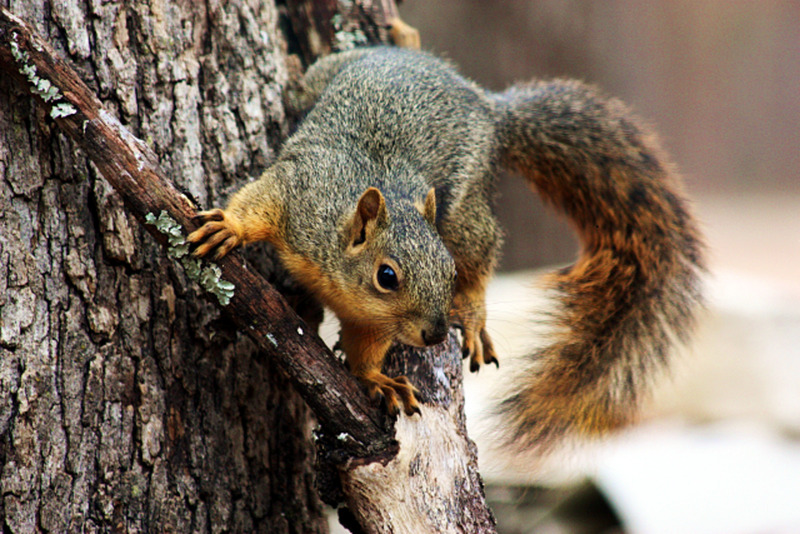 If you have a bird feeder, you probably have squirrels raiding it! We had to find a way to squirrel proof our feeder as they were eating all the bird food. Maybe there are rabbits munching on your garden or flowerbed. Nature photography can also be lizards or even snakes can be beautiful, but do be careful there! Get outside early, before it gets too hot. The animals are easier to find early of a morning or late of an afternoon, when the weather is cooler. Animals usually take the same route as they go out to find food. The deer cross our pasture at the same place nearly every time. The turkey usually use the same path as well. Remember where you have seen the wildlife in your area and set up ahead of time. For more detailed information on wildlife photography you may find "5 Wildlife Photography Tips for Beginners" helpful. Don’t’ forget the smaller members of nature. Look in the grass or under the leaves of your flowers, there maybe some interesting little insects hiding under there. Insects and bugs can me interesting subjects to photograph. Whether they may be spiders, ladybugs or grasshoppers, there are usually plenty of little visitors in your backyard. Of course, butterflies always make beautiful photography subjects, but so can spiders and their wonderfully woven webs. I have taken a spray bottle and lightly sprayed water on a spider web to get a very beautiful picture. Insects and bugs are going to be much easier to photograph as they usually are going to be sitting still. Zoom in on them as much as possible, get really up close and personal! While watering one of my flowerbeds, a praying mantis ran out from under some flowers. I don’t think he much liked the early morning shower he just got. What are your favorite things in nature to photograph? Take your camera and get outside! Train your eyes to really see what is there. Challenge yourself to learn something new by re-visiting the old. Remember, your backyard has a host of subjects. 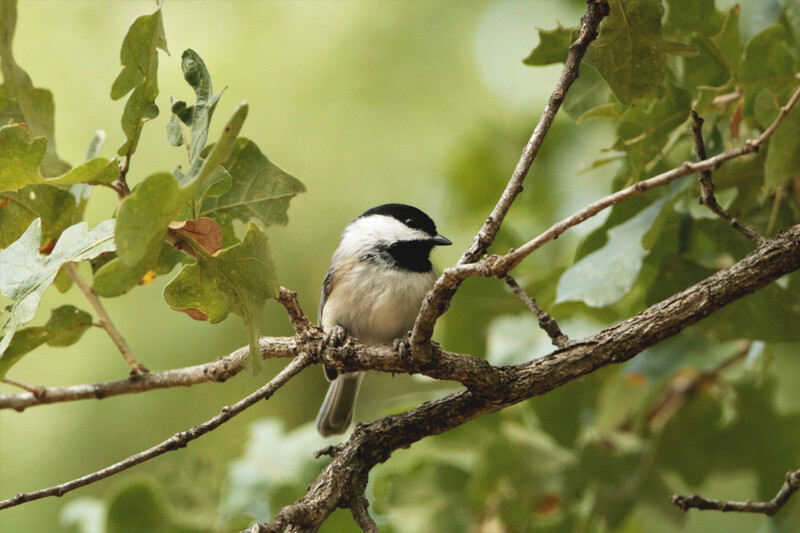 Whether flowers, birds, or bugs, using these tips, you can take some great nature photography, right in your own backyard! Yes, this gave me some good ideas! Not really, I don't take many pictures. No matter what season it happens to be, beautiful nature pictures are out there, waiting to be captured. Here are some ideas to help the beginner get started in any of the four seasons for nature photography. Here are some tips on how to take better, more natural looking pictures while at the zoo. Here are some good deals on great cameras! I know what you mean about the rogue squirrels! Although we have found a way to keep them off the feeder. With the bird feeders, I can get plenty of pictures of birds and squirrels. Thank you for stopping by! I never really thought about it but one good reason for a bird feeder, besides feeding those damn rogue squirrels, could be to get some bird photos. So many people don't see what close to them. My dad, who was an artist, taught me to see the beauty in little things. He always said: even a square meter of concrete has beauty, but your mind must be open to see it. You sure can get really great photos in the surroundings:) Great photos and hub. I recently built a bird feeder that I hung outside my balcony. I covered it with branches from a tree right next to it, and set my camera up pointing at it on a tripod. I sat inside and when birds landed on the feeder, I used the remote to take pictures so they wouldn't get scared away. I got amazing pictures of sun birds and song birds and because of the tree it looked like it was a natural shot! The praying mantis picture was my favorite...I should look into photographing insects...think I've been missing something special there. Thanks for writing. Great tips! And your photographs are beautiful! Thanks for sharing it all. I love to look at the beauty of nature. I love to look at the pictures you have taken. Voted-up, Awesome, Beautiful and shared and pinned to my Art and Writing board. Hi Mary! Wow, you are going to make my head swell! Thank you for such a compliment. I will be watching for your new hub, I'm sure it will be just as awesome as all your others. I appreciate the link! I apologize for the delay in replying to your wonderful comment here, yesterday was a very busy day. Beautiful article and your photos are wonderful. You certainly know how to take nature photos. Thank you for sharing your knowledge with us. I am writing a hub about the beauty of nature and linking this hub to mine. However, I'm almost hesitant because your photos are so totally awesome I'm afraid they'll make mine look bad! Yes, I know! My father was a professional photographer, but Ansel Adams is known for that particular technique, and that was advice that he gave. Take lots and lots of pictures so that you will have plenty to choose from. He would take hundreds of shots of a subject and destroy all but one or two. The reason I asked about the Praying Mantis, there was one on my patio, and I went to tell my husband, because I was excited and had never seen one before. Hubby came with the insect spray and sprayed it. I felt like I had committed a sin. I was sorry I told him about it. SG wonderful hub. voted up and sharing. I need to ask a question, the Praying Mantis, what do you know about them? Your photography is dramatically beautiful! What else is there to say except THANK YOU so much for sharing all this on HubPages. I enjoy your close up views as well as those far away shots of the animals. I voted for 'wildlife' because that included (sorta) all of the above and that would have to be my choice...all of the above, I guess. Enjoyable hub, and its tips for great photos is appreciated! Beautiful Beautiful pictures. Looks like you live in the nature. I am kind of stunned that you live in that part of world which has such a diversified nature. voted up and sharing. Great photos and tips! I love the photo of the squirrel. Amazing! I have a nice view from my backyard, but never thought of taking nature photographs there. Great idea! Your camera has captured some amazing poses. Great hub! I am starting to play around a bit with a camera and it is fun! What wonderful pictures you got! I know now that I need a better camera to get the shots that I want. I still enjoy myself, though. Very well done! Upped and shared to my friends! Seriously, WOW! Those shots are amazing! Are you a pro?? I have to agree, I have found some very interesting things to photograph within a mile of my apartment. Heck, sometimes they come to me (like the herd of deer). Excellent hub, sgbrown! Beautiful pictures. All pictures are equally beautiful. I have spend time more on pictures than reading your hub. You have shown the beauty of nature through brilliant pictures. Absolutely stunning photos proving your point that we need go no further than our own backyards to find interesting material to photograph! Your tips are great and it's easy to see that your patience and planning really pays off. 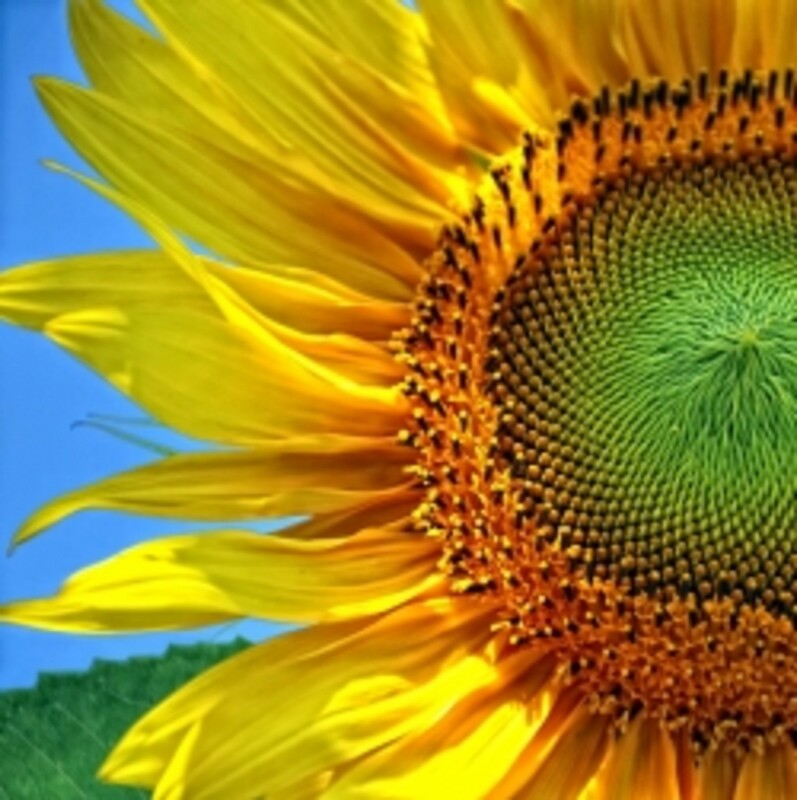 That first photo of the monarch butterfly on the sunflower literally took my breath away! The thing I like most about photography is that it does train our eyes to really see what is there. When I walk with my camera, my awareness of everything that's around me is greatly heightened which makes each walk fresh and new, even if I've taken the exact same path many other times. Great pictures. You are right, wonderful subjects are just outside our door. After all, if someone were to visit us, any of the shots they take are their travel shots. Hello dahoglund! Since I have started writing here, I have not been taking pictures like I used to. I have been missing it. I need to get started back on my walks every morning, that is when I enjoy taking pictures. Thank you for your kind comment, it is always appreciated! Have a wonderful day! You are right.There is photo opprotunity everywhere. I am trying to renew and interest in picture taking that I had years ago. I learned back then that it might be best to limit the space one covers as a way to develop an eye for phot subject matter. Great advice! I agree, inspiration can be everywhere and nature is definitely a never ending source of inspiration. I just wrote a hub on nature photography and photography tips with several flower photos I took in my own garden. 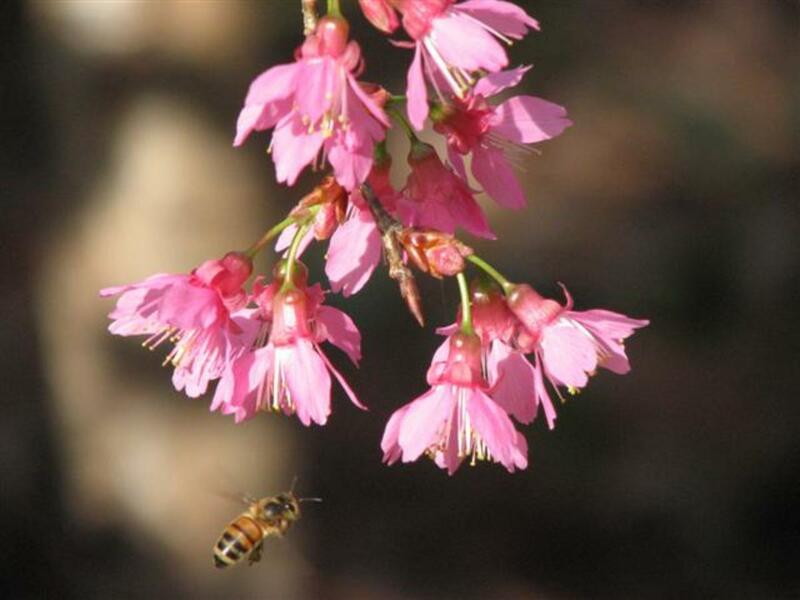 I added a backlink to your beautiful hub using the anchor text "nature photography"; hope you don´t mind and thanks for writing interesting, high quality hubs that allow me to use this tool. Love your picture wish my would come out as nice. I have a kodak and it works but not great when I need a close up. Like today when I was chasing the bluebird around the yard for life of me I could not get a good picture. This is excellent. I love my Canon as well. Love to try new things. Can't wait to read more of your articles to get new ideas. Great hub. Love the photos! You have captured some amazing shots with your camera. I loved the praying Mantis with drops of water on his tiny legs. Fantastic! You are very talented photographer. Thank you for SHARING your beautiful work with us. Voted up and very beautiful. Hello brandrocker. Nature's beauty is all around us if we just open our eyes and our minds. Thank you for commenting on my hub. It is greatly appreciated! Have a wonderful day! There are beauties everywhere. You need to see through your mind. Absolutely agree with you. Tremendous hub and I have wished many times I had my camera with me in my own backyard. We live in rural WNC and opportunities for those photo's such as yours are always in view. Enjoyed yours so much and thank you for sharing. Hello mooboomoo! I have chickens also. They can be quite funny at times. I just love taking walks and enjoying nature. There is so much nature all around us, I just want to appreciate it. Thank you for your comments, vote and sharing. It is always appreciated. Have a wonderful day! I am going to let you be an inspiration. I'll put together a few shots from my back yard. There are all kinds of weird bugs around. sgbrown! I love your pics. I also have a passion for photography (self taught). I love taking sunset and sunrises. Thank you for sharing your talent. Voted up!!! I agree nature can be discovered in the best places. We plant lots of flowers to attract butterflies and always enjoy the photos. Great Hub!! Great Hub, I too love taking photographs in my backyard, especially when I find a new bug or my chickens are being funny. Voted up and shared! A lady after my own heart! I love taking photos of things in our own yard and garden. It is obvious that you have a much better camera and lens than I do...but my simple digital Panasonic does the trick for me and makes me happy. That wet praying mantis photo is amazing! It has been a while since I have seen one of those. Voted useful, beautiful and will share. Great hub. When you are looking for things, you see things in a different light. It's as if we have filter out things until we have a reason to see them. Thank you for SHARING. Great hub! I agree - there are a lot of potential subjects to photograph right in your own backyard, or pretty much anywhere you might go. I really enjoy taking photos of the flowers and plants in my garden at different times of year, as well as trees, birds, butterflies, squirrels or whatever else I can find. You've inspired me to go take some more photos today. Thanks! Wonderful hub! There is so much our backyards have to offer. I always get excited when I see turtles coming up out of the woods to visit our gardens. And often we have baby squirrels that come out of a next each year that are a blast to watch while they play (but too fast to catch with a camera). Up and Awesome, loved the praying Mantis pic. I saw a baby one of these years ago, really cool to watch, but unfortunately didn't even have a mobile camera with me. You were lucky to catch that shot! Yes I take pictures, I love just going for a walk with my camera and take pictures of everything nature. I usually take a lot of pictures of what may look like the same thing but the slightest difference in angle, distance and setting can make each picture special. Thank you catchadream! Glad you agree, do you take pictures also? Great Hub, I could not have said it better myself. What a wonderful inspiring hub!